Тема в разделе "СКАМ", создана пользователем All-HYIPs.info, сен 7, 2018. 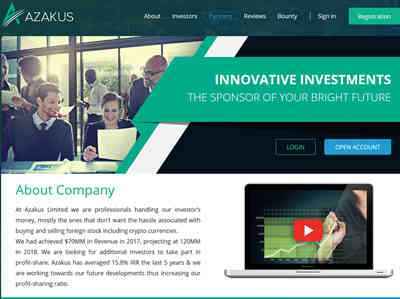 At Azakus Limited we are professionals handling our investorвЂ™s money, mostly the ones that donвЂ™t want the hassle associated with buying and selling foreign stock including crypto currencies. We had achieved $70MM in Revenue in 2017, projecting at 120MM in 2018. We are looking for additional Investors to take part in profit-share. Azakus has averaged 15.8% IRR the last 5 years & we are working towards our future developments thus increasing our profit-sharing ratio. 07.09.18 10:45 Transfer Sent Payment: 60.00 USD to account U18146067 from U1294xxx. Batch: 227514874. Memo: Shopping Cart Payment. Deposit to AZAKUS LIMITED User allhyips.